Our Handheld Pocket Telescope is the perfect tool for bird watching, concert watching, golfing, hunting, climbing, fishing, attending sports events or simply sightseeing. Thanks to its adjustable & universal fit, It is compatible with all smartphones. Simply mount your smartphone on the adjustable holder! 40X60 High Power Magnification: Have the best view in your outdoor adventures. To see 40X closer with a clear and bright image with the generous, light-gathering 52mm objective wide lens. Large BAK-4 Prism & Fully Multi-Coated Lens: Strengthen the key function of a monocular, guarantee superior light transmission and brightness, make your view brighter, clearer and delivers crisp images. Waterproof, Dust-proof, & Shockproof Design: Nitrogen-filled waterproof and O-ring sealed optics prevent moisture, dust, and debris. Ideal For Outdoor Enthusiasts & Sports: It is a handheld device and must-have for bird watching, wildlife, hunting, hiking, mountaineering, camping, surveillance and traveling. Its tight-fitting protection makes it usable to withstand the toughest weather conditions. The rubber armor with stripes makes it comfortable to use and keeps it from slipping out from your hand. Thanks to Its solid framework & shock-absorbing rubber armor, this is the perfect tool for your adventures. Great,100% satisfied,Very clear easy to focus.Great product. It’s a high-quality built product and it is also fun to use. I like everything about this monocular .It just takes 1 or 2 minite to mount my phone on the monocular.. It delivers crisp and sharp images, fits nicely in the palm of my hand, and it is built really rugged. Again the images are very clear. 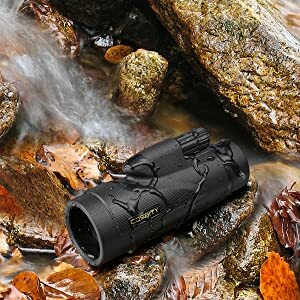 Pretty good light weight monocular, I use this with my phone to see long distance and take pictures. It's full rubber so it can take a drop and won't hurt my phone. We took it for camping, we used this to watch the stars and also the mountains that really far away! The kids they like it so much! The good thing is that it is so small and light which is easy to take anywhere! My son enjoyed this product during his science camp. He was extremely happy when he came back from his trip. Recommended product.